To celebrate the holiday season this year we’ll take a look at Christmas Trees, whose “leaves are so unchanging. Not only green when summer’s here, but also when ’tis cold and drear”1. 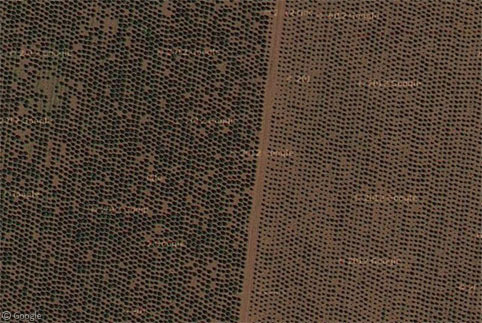 In the United States, an estimated 31 million Christmas trees are sold each year, with over 7 million of those being grown in the north-western state of Oregon, where large areas of land are dotted with carefully planted rows of trees in various stages of growth. Each tree has to be carefully trimmed each year to ensure that it grows into the perfect conical shape. Holiday Tree Farms claims to be the world’s largest Christmas tree farm, selling over a million fir and pine trees every year. 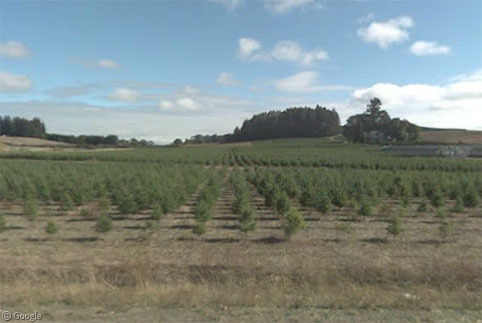 Because the trees2 take several years to reach the required size, their farms across the state total are growing around seven million trees at any one time, and of course every year they have to plant a million trees to replace the ones sold! 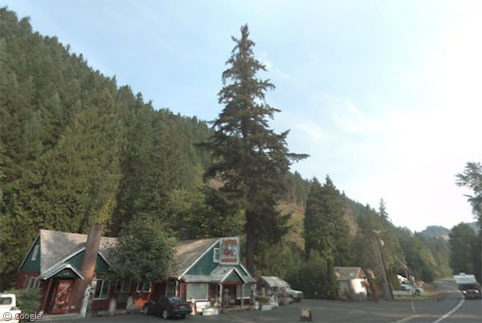 Oregon is also home to one of the many locations which claim to have the world’s tallest lighted Christmas tree, a douglas fir in Blue River that is close to 50m (160ft) tall. Located next to a year-round Christmas store, the tree is strung with around 50,000 lights. 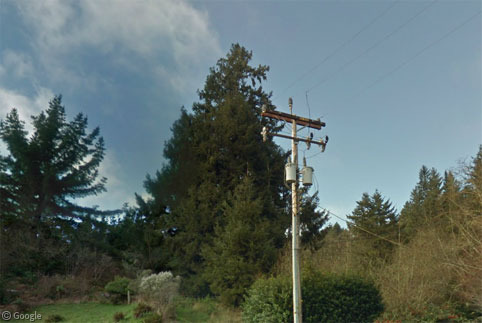 First decorated in the mid-1990s, the local power company quickly shut it down, but allowed it to be lit again a few years later when low-power, flame-proof lights became available. However, there are many other communities around the US which claim the title of tallest lighted tree, or tallest living Christmas tree. The small town of Ferndale in California decorates this large spruce tree at the end of Main Street, and claims it is 46m (151ft) tall. 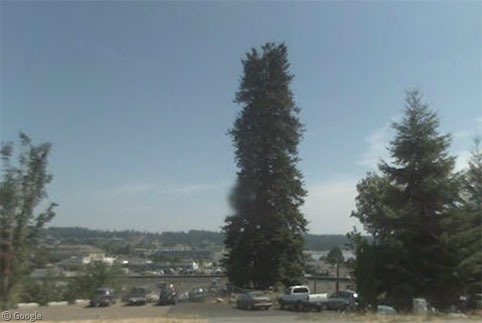 Silverdale in Washington is proud of its grand fir tree, though at 39m (128ft) it would appear to be considerably shorter than the ones in Blue River and Ferndale, and a similar sized one in Coeur D’Alene, Idaho, which I was not able to track down on Google Maps. While the west coast may lead in quantity and height, on the other side of the country North Carolina can claim to have supplied the most trees to Presidents in the White House. A national contest takes place each year to decide who can supply the best quality tree for installation in the Blue Room and decoration by the First Lady. 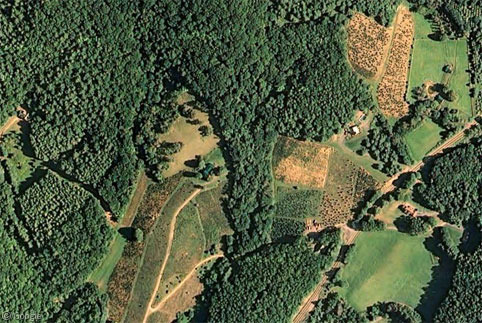 North Carolina has supplied the tree 11 times, including this year, with Peak Farms near Jefferson providing a 5.5m (18½ft) tree. 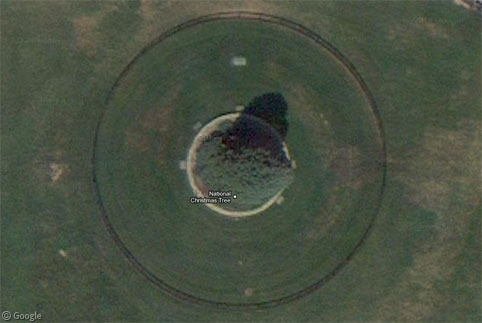 Meanwhile, the satellite image of the US National Christmas Tree on the Ellipse near the White House looks much the same as when we looked at Christmas trees during the site’s first holiday season back in 2005. Security restrictions prevented the Street View car from getting a close-up look. 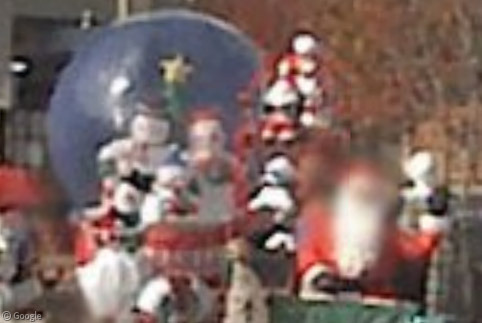 In England, there is annual contest to select decorations for the Prime Minister’s residence at 10 Downing Street. For the large tree outside the front door the winner announced in October was a tree from Garrocher Tree Farms in Dumfries, south-western Scotland. 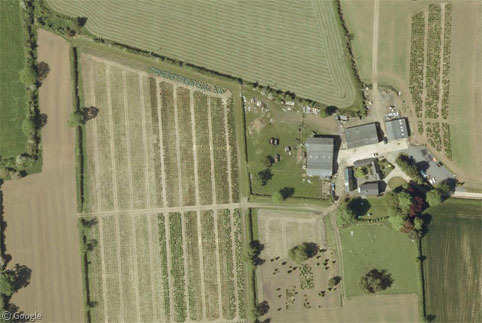 The larger image at the top of this post is also from this farm. 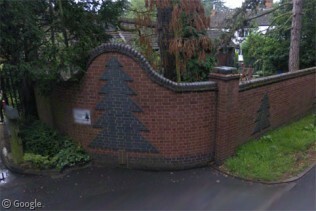 The runner-up tree which is displayed inside the residence came from Oakberry Trees in Leicestershire. And the wreath for the front door was created by Woods Farm near Solihull, who have supplied trees to Downing Street in the past from their large farm with trees at various stages of growth, and a decorative wall which makes it clear what type of farm it is! 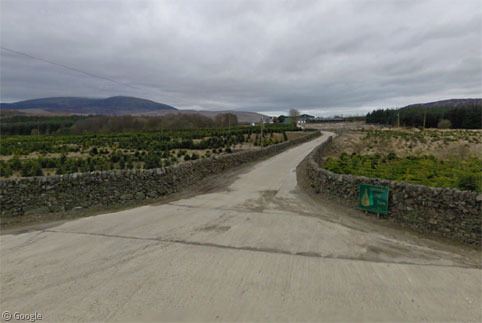 Meanwhile there are plenty of notable ‘Christmas Trees’ which don’t actually have unchanging green leaves, and which are not actually trees at all. They are created from vaguely tree-shaped objects strung with lights in a vaguely tree-shaped pattern. 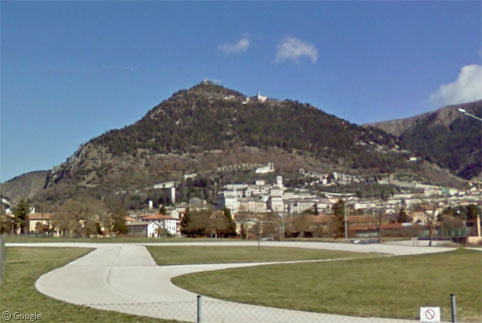 The town of Gubbio in Italy outdoes the rest of the planet in the ‘largest Christmas tree’ stakes, creating a 650m (2,130ft) tree on the side of a mountain! Mount Ingino is decorated with hundreds of lights and topped with a 1,000 square metre star. Last year the Pope switched on the lights from the Vatican (using an iPad). Despite the size of Gubbio’s claim, in the Netherlands, the Gerbrandy Tower is claimed to be the world’s biggest Christmas tree. The 375m (1,230ft) radio and TV transmission tower and its guy wires are lit each December, though last year a fire limited the decorations. 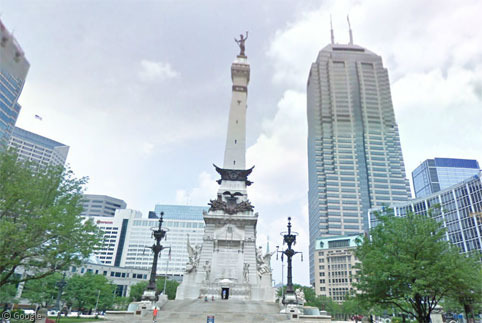 And in Indianapolis, the 87m (285ft) Soldiers and Sailors Monument is transformed into a giant Christmas tree as part of the Circle of Lights holiday decorations, this year celebrating their 50th year. 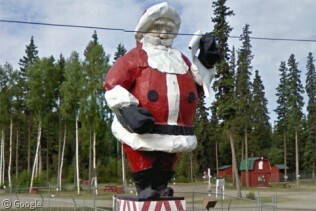 If you know of any special Christmas trees that can be found on Google maps, please post a link in the comments. The largest Xmas tree in the world (367m) is situated in The Netherlands, city of IJsselstein. 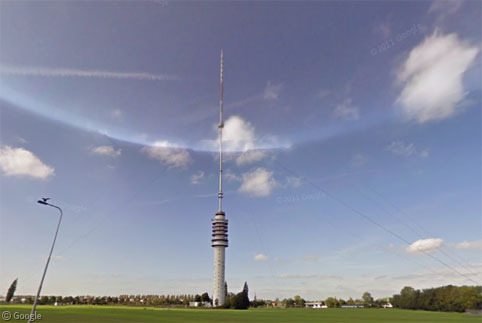 Each year the ‘Gerbrandy Television Tower’ is lighted with hundreds of lights, which can be seen up to 30 kilometres. Michiel – perhaps you didn’t read all the way to the end of the article? I include the Gerbrandy Tower, though it’s claim to be the largest is negated by Gubbio’s decorated mountain. Merry Christmas! Did you notice the neighbor’s peacock on the lawn in front of their house immediately to right of the Christmas tree?